Tom Iversen tried prepare for every possible thing that might happen, he told Minneapolis' Twelve TV in 2013. One of the things that Iversen, the athletic trainer at Minneapolis' Brooklyn Center High School, had to prepare for was lost teeth. A new method of doing that, "Save-a-Tooth" kits, made the process of saving teeth easier, Twelve TV wrote. "I walked into my athletic director's office and there they were, sitting in my mailbox," Iversen told Twelve TV in an article about the kits. "And I just said to him, hey you made my day." 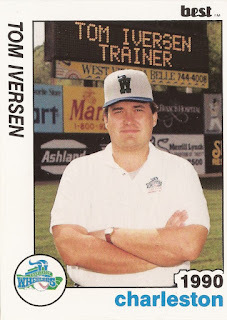 Iversen's work at Brooklyn Center was a continuation of a long career as a trainer that began in professional baseball. Iversen spent more than five years as a trainer in the Reds and Twins systems before turning to sports medicine at the youth level. Iversen's career began in the Reds system in 1989. He spent that season as trainer at single-A Greensboro. He moved with the Reds team to Charleston for 1990. He returned to Charleston for 1994. Iversen arrived at Brooklyn Center by 1999 and he has worked in Minneapolis Public Schools since, continuing in 2015, according to his LinkedIn profile.